Fast bowler Mitchell Starc has added his name to a celebrated list of Australia cricketers by being awarded the Test Player of the Year prize in recognition for his stellar 12 months. 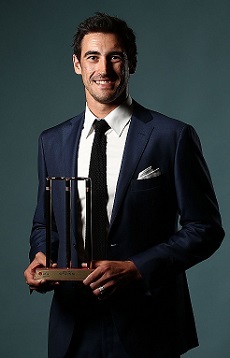 Starc, who missed much of the first half of last year after undergoing ankle surgery late in 2015, received the honour at tonight’s Crown Lager Allan Border Medal presentation at Star Sydney. The left-armer was his team’s leading wicket-taker for the voting period – stretching from 8 January 2016 to 7 January this year – during which his team endured a rollercoaster ride of Test match form. That included a five-match losing streak against Sri Lanka and South Africa where Starc was not only Australia’s most effective bowler but a rare bright spot in what became a gloomy landscape. When the Test team was radically revamped in the wake of Australia’s thumping defeat at the hands of the Proteas in Hobart last November, Starc continued to lead the attack with his remarkable capacity to take early wickets with the new ball. He finished ahead of his captain Steve Smith – the other consistent performer in the red-ball format throughout 2016 – and vice-captain David Warner in the voting to win the coveted award for the first time. In doing so, he joined a prestigious list of former winners that includes ex-Test captains Michael Clarke (2009 and 2012-14), Ricky Ponting (2003-04, 2007) and Smith (2015), as well as Glenn McGrath (2000) and Shane Warne (2006). More notably, he became the first bowler to be recognised as Australia’s premier Test player for almost a decade, with the prize being shared exclusively by batters since Starc’s fellow fast bowler Brett Lee earned the honour in 2008. Starc’s form since returning from a lengthy lay-off in the middle of last year has been compelling, finishing with 52 wickets at an average of 24.29 having taken five wickets in an innings on three occasions. The next-best bowler over that time was his new-ball partner Josh Hazlewood, who finished the voting period with 48 wickets at 25.10 from two more Test appearances. The 26-year-old attributed some of his consistency and effectiveness to the surgery that successfully removed a 2cm piece of bone spur that had detached and was floating in his right ankle joint. When a stress fracture in the same foot that he sustained during the historic day-night Test against New Zealand in Adelaide in November 2015 provided a fortuitous time in which the ankle problem could be addressed by surgeons. “Having that (floating) bone taken out the back has done wonders for it,” Starc said shortly before he returned to Test cricket against Sri Lanka at Pallekele last July. “That movement has been fantastic, ever since I started bowling again after surgery. “There has definitely been no pain there through the West Indies (ODI campaign last June) and through the start of this tour. “It’s a fantastic result and I’m looking forward to hopefully playing a much longer period of cricket now.” Since returning from the surgery, Starc has not missed a match through injury and will play a key role in Australia’s of defying history and expectation when they undertake their four-Test Qantas tour of India next month.